US Release Date: April 4th, 2008. Filming: from June of 2006 in New York. 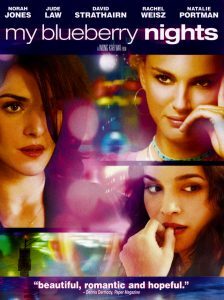 Plot Summary: Romantic comedy about a young woman, Elizabeth (Norah Jones), mired in depression over a recently ended affair. She strikes up a friendship with Jeremy (Jude Law), who runs a bar-restaurant in one of the seedier sections of New York. On her frequent visits there, she orders blueberry pie — a dish no one else orders — and he falls a little in love with her loneliness. She leaves New York for Memphis, where she gets a couple of waitressing jobs and meets several interesting characters including Leslie (Natalie Portman), a canny gambler who’s got a sassy line of patter and is almost, but not quite, as good at cards as she thinks she is. Notes: – Natalie had to be taught poker for the film. Some of which can be read about here.